Leading aircraft cabin lighting company STG Aerospace is today launching saf-Tsign® blu, the world’s first and only blue-glowing photoluminescent aircraft signage. 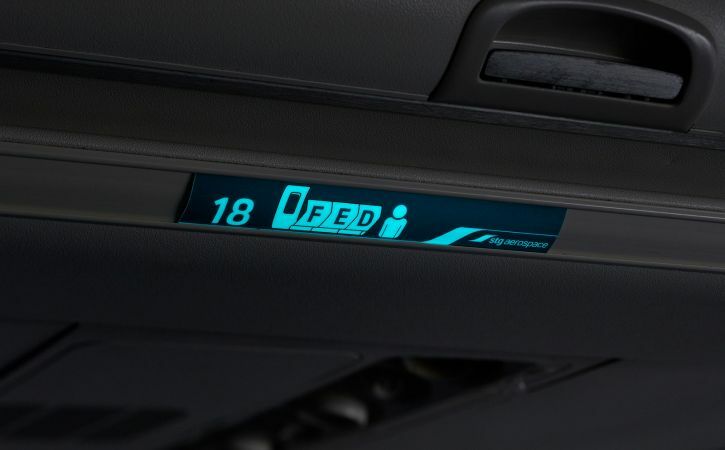 Ideal for emergency, informational and custom signs, the unique and patented saf-Tsign® blu design combines top-class cabin aesthetics with an absolute focus on clarity and safety. Further benefits include minimal maintenance and operational costs. saf-Tsign® blu builds on STG Aerospace’s proven, market-leading saf-Tsign® range of easy-to-install, environmentally friendly, non-powered photoluminescent signage, available for all aircraft types. O’Kell continues: “With the new saf-Tsign® blu, we’re expanding our portfolio, building on our traditional green-glowing signage to add a cool and soothing blue look. Blue signage will also be more ‘on-brand’ than green signage for many airlines and can be easily tailored to match airlines’ CMF palettes. “Photoluminescent signs – in simple terms, ‘glow-in-the-dark’ signs – are 100% fail-safe with no running costs, which makes them perfect for commercial and military aerospace use. saf-Tsign® blu signs, for example, are fully charged by cabin lighting in minutes. The look and operation of this new product line beautifully combines our design and engineering expertise. “Blue is a very calming and aesthetically pleasing colour,” adds O’Kell. “It’s relaxing and refreshing, with an output that won’t disrupt passengers in a darkened cabin. Naturally, therefore, it’s a colour we love and we already offer a blue setting for our liTeMood® cabin lighting system and saf-Tglo blu FPM systems. This way we can offer a cohesive cabin aesthetic to customers.